November 2010 Status Report for the Makua and Oahu Implementation Plans. Prepared by: Oahu Army Natural Resource Program U.S. Army Garrison, Hawaii and Pacific Cooperative Studies Unit Schofield Barracks, HI 96857. Click here to view a list of contributors. 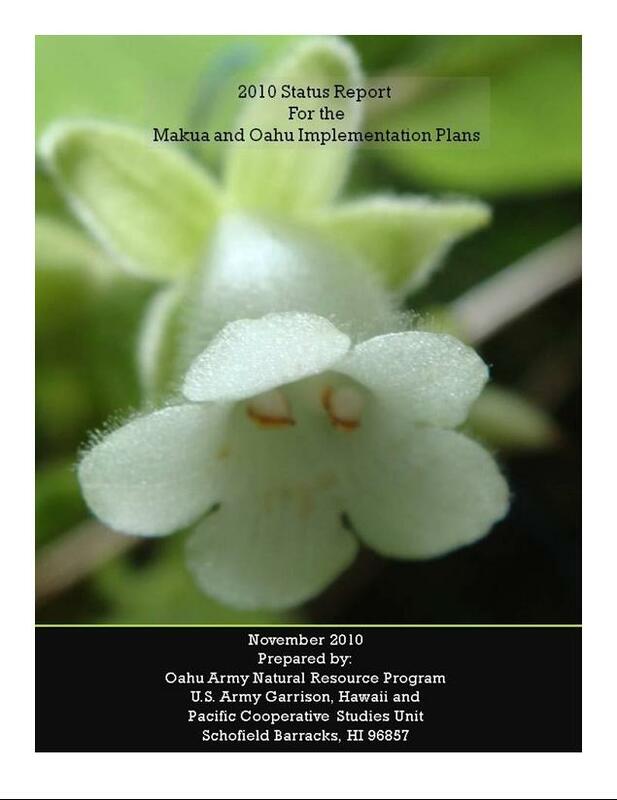 This report serves as the annual status report to the Implementation Team (IT), and participating landowners on the Makua* Implementation Plan (MIP) Year-6 actions and Oahu Implementation Plan (OIP) Year-3 actions that occurred between 1 September 2009 and 31 August 2010 and also serves to report compliance to the U.S. Fish and Wildlife Service. The Oahu Army Natural Resources Program (OANRP) has just completed implementing its sixth year of the Makua Implementation Plan Addendum (2005) and the third year of the Oahu Implementation Plan (2008). The Makua Implementation Plan (MIP) was finalized in May 2003. In January 2005, the Army completed an Addendum which emphasized management for stability of three population units (PUs) per plant taxon in the most intact habitat and 300 individuals of Achatinella mustelina in each genetically identified Evolutionarily Significant Unit (ESU). The 2007 Makua Biological Opinion (BO) issued by the U.S. Fish and Wildlife Service (USFWS) required that the Army provide threat control for all Oahu Elepaio pairs in the Makua action area (AA) and stabilization for 28 plant and one snail species. *Hawaiian diacriticals are not used in this document except in some appendices in order to simplify formatting. Please refer to Appendix 1 Spelling of Hawaiian Names. Appendix 4-2: Euglandina rosea detection by dogs, February-March 2010, Hurt and Whitelaw (Working Dogs for Conservation), April 2010.